CONTRAVENING THE SHOPS CLOSING ORDER 1915. Four prosecutions against Hamilton shopkeepers, at the instance of John Millar, who was the inspector for the burgh of shops act were disposed of in the Hamilton Sheriff court on Tuesday the 24th of February 1915. Two were for keeping the premises open for the transaction of business after seven o’clock at, night, and two were for being open on Christmas Day after one o’clock in the afternoon. The prosecutions were conducted by Walter Henderson. Deputy Town Clerk. The first case called was that of John Woods who charged with keeping his shop at 216 Low-waters open after seven on, Friday, January 19th contrary to the Butchers and Fleshers Closing Order. He pleaded guilty, and Mr Donald C Orr, Writer explained that the case was a very narrow one. While the woman in the shop had been served 10 minutes after 7 o’ clock, she had actually entered the shop before the closing hour. The Sheriff asked if a shopkeeper was not entitled to serve a customer who entered his shop before the time of closing. Mr Henderson replied in the affirmative but added that what Mr Orr stated was not his information. The customer had entered the shop 7.12, and when a constable, who had followed, asked the shopkeeper if he knew what tame was. He had replied a quarter past seven. Henderson added that there had been some trouble in the district because two or three shopkeepers were keeping open after hours. The Closing Order had been obtained at the direct request of the butchers themselves, and it was rather an expensive business issuing such Order. Sheriff Shennan remarking it was unfair to the other shopkeepers remain open after hours, imposed fine of £1, with the option of five day’s imprisonment. William Andrews, another butcher of 226 Low-waters, pleaded guilty to a similar offence the same date. Mr Orr having been heard on behalf of the respondent had the same penalty of £1 or five days imprisonment was imposed. James Marshall of 599 Sauchiehall Street in Glasgow, who was the manager to William Marshall & Co, boot makers in Quarry Street, Hamilton, was charged with keeping open on Christmas Day after one o’clock, contrary the Shops Act and the Burgh of Hamilton Non-Exempted Shops Order. Mr J. Edmonds, writer. Hamilton, tendering a plea of guilty for respondent, stated that he was a manager for a firm which had shops in many towns including Hamilton. The weekly half-holiday was Wednesday, but at Christmas week the respondent had overlooked the fact that Hamilton was an exception for that week, having decided to open on Christmas Day. Margaret Boyd or Orr admitted to having her shop premises 142 Low-waters open after one o’clock Christmas day. Mr Ritchie, a writer, explained that while respondent should have been closed at the libelled for the sale of toys and knick-knacks, she had the right remain open for the sale of aerated waters, papers, and confections. She was in the act of selling a sixpenny doll to a girl when an officer entered, and, on pointing out her mistake, she once took back the doll and gave the girl back her money. The Sheriff (with a smile) stated the respondent was entitled to be two-thirds open. Mr Ritchie even more; I think she had a seven-eighths opening. (Laughter in the court). The Prosecutor admitted that this was not a flagrant case, but still the respondent had not the Closing Order notice exhibited in her shop. A modified fine of 6s was imposed. 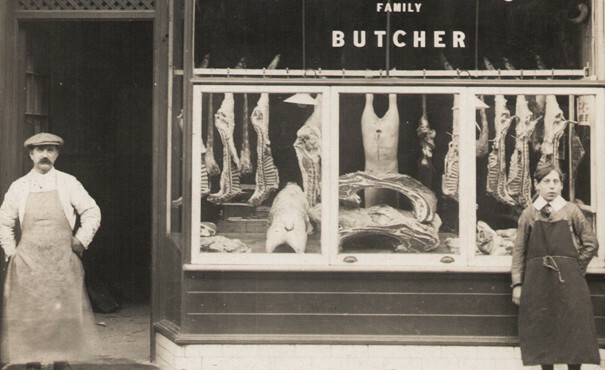 Posted on March 31, 2018 Categories Garry L McCallum, Hamilton, Historic Hamilton, UncategorizedTags Butchers, Low Waters RoadLeave a comment on CONTRAVENING THE SHOPS CLOSING ORDER 1915. Posted on March 17, 2018 Categories Garry L McCallum, Garry McCallum, Hamilton, Historic Hamilton, UncategorizedTags Castor Oil, James Hamilton, Jimmy Hamilton, Saftey Pin, Steak Pie Jimmy3 Comments on JIMMY HAMILT0N. The O’Donnell family from Donegal. We were contacted by Ron Currie from Stirling who is currently researching his family tree on his great, great grandfather side and his 2 x great grandfather was called James O’Donnell. Ron was curious as he never knew about his Hamilton Connections and he asked us where Leechlee Street was in Hamilton. Hi Ron, so to answer your question about Leechlee Street. Leechlee Street was a street with roughly 21 tenements on it and it was constructed before 1855 and was still known as Leechlee Street after 1958. It was presumably demolished when the new Gateway shopping centre was under construction in the 1970s. As I don’t have the exact date, perhaps some of my readers can confirm this? After the tenements were demolished, the street was renamed Leechlee Road, so this should give you an indication of where the Street was. Downie Street is situated in the Low Waters area of Hamilton. When your Great Grand Uncle lived there it was just a small street with around three tenements. It was constructed between 1895 & 1905 and named after its builder who was called Robert Downie. Robert Downie was a Stone Mason Contractor and he lived around the corner at number 8 Selkirk Street. There are many branches of O’Donnell’s living in Hamilton I have O’Donnell’s in my family tree and most of them were coal miners and at the moment I can’t see a connection with our families. Ron, I see from your 2 x Great Grandfather’s death certificate which you sent me, that he was a shoemaker, and this was the family tradition, as your 3 x Great grandfather was also a shoemaker too. I looked at the 1891 census of Hamilton and James was living at 226 Quarry Street with his family. The family immigrated from Ireland between 1882 & 1885, this information comes from the birth of your great-grandfather in Ireland and your great uncle James who was born at Hamilton in 1885. I already had a copy of your great uncle James’s birth certificate and Interestingly, when your great uncle James was born, your 2 x great grandfathers occupation was recorded as a coal miner. Perhaps this was just a stop-gap until he set up his new business in Hamilton as a Shoe Maker? Ron, the birth certificate of your great uncle James also tells us that your 2 x great grandparents were married at Donegal in Ireland! My own family connection to the O’Donnell’s also come from Donegal in Ireland, so it is a possibility that your 2 x Great grandfather is a relation to the ones in my family tree. My family line are not direct descendants of the O’Donnell’s, but the people in my tree are descendants of Richard O’Donnell & Alice Muirhead. Do these names mean anything to you? If any of our readers who have researched their family tree and are descendants of James O’Donnell and Mary Brogan, then please make yourself known and say hi to your cousin Ron Currie from Stirling. Ron, I hope that this has shed a wee bit of light and given you some insight into where your family lived when they were in Hamilton. Thank you for contacting Historic Hamilton, we have now taken note of this family line and we have documented it and please let us know if you have any other connections to our Town. Posted on March 13, 2018 March 13, 2018 Categories Garry L McCallum, Historic Hamilton, UncategorizedTags Coal Miner, Donegal, Downie Street, Leechlee Road, Leechlee Street, O'Donnell, Robert Downie, Shoe Maker, Stone Mason in HamiltonLeave a comment on The O’Donnell family from Donegal. There were several houses, including the Miller’s dwelling, a lodge of the “High Parks” of Hamilton and some colliers’ dwellings, which bear the name of the Mill. “Robert Fleming who had a lifelong connection with the Mill was well known among the farming community, in the west of Scotland. He was a widower and 69 years of age. An office-bearer in St. Johns church, Hamilton he had a lifelong connection with the congregation. He was predeceased by his wife some years ago”. Posted on March 4, 2018 March 4, 2018 Categories Garry L McCallum, Garry McCallum, Historic Hamilton, Uncategorized, www.historic-Hamilton.co.ukTags Alexander Fleming, Avon, Avon Bridge, Avon Mill, Crookedstone, Crookedstone Farm, D & R Fleming, David Fleming, Duke Street, Hay Stack, High Parks, Italian Connection Furniture Shop, Kemp Street, Marion Young, Old Avon Bridge, Old Avon Mill, Oreste Pisano, Pinnochio Italian Resterant, Raith Farm, Robert Fleming, Thomas Telford, Toll HouseLeave a comment on OLD AVON MILL. Glenlee Primary 1985, P1. Can you put some names to faces? Posted on March 1, 2018 Categories Burnbank, Garry L McCallum, Hamilton, UncategorizedTags 1985, Glenlee, Glenlee PrimaryLeave a comment on Glenlee Primary, 1985.